The rules of golf etiquette are what they are for several very important reasons: Many of them relate to the safety of golfers, many relate to pace of play (which helps keep the game enjoyable), and other rules of golf etiquette relate to maintaining the quality of the golf ourse. In other words, golf etiquette is an essential part of the game. And it's something that newcomers to the game often learn as they go - on the course, when playing with more experienced golfers. Do not swing your club until you know that others in your group are at a safe distance. Likewise, keep your distance when others are swinging Be aware to steer clear of trouble. If your ball appears headed toward another player or another group, give them a warning by yelling out, "Fore!" Observe the safety suggestions posted in golf carts and drive carefully. Golf etiquette requires keeping your cart off the grass as much as possible. Keep the round moving by being prepared to hit your shot when it is your turn. You probably don't like waiting on other groups - don't make other groups wait on you. The player who is away hits first in a group. However, in friendly matches (as opposed to tournament play), this rule can be ignored in favor of "ready play" - players hit as they are ready. All players should agree to "ready play" before it is put into effect. Do not spend too much time looking for a lost ball, particularly if there is a group behind you ready to play. If you insist on taking the full five minutes alloted to look for lost balls, golf etiquette says wave up the group behind to allow them to play through. Observe cart rules. Some courses will post "cart path only" signs; Do as you are told. Always rake sand traps after hitting to erase your footprints and damage to the area where your ball was. Never take a divot on a practice swing. Quiet, please! Never talk during another player's swing. Do not yell out following a shot. Even if boisterous behavior doesn't bother your playing partners, there are other people on the course who may be within earshot. Be aware of your shadow on the putting green. Don't stand in a place that causes your shadow to be cast across another player or that player's putting line. Never walk through a playing partner's putting line. Your footprints might alter the path of a partner's putt. Step over the putting line, or walk around (behind) the partner's ball. All fences, bridges and lemon grass are integral parts of the course. All irrigation equipment, fixed sprinkler heads, water hazards stakes, artificially surfaced cart paths, buggy pegs, drainage sumps (including in bunkers), course signage, ball washers and bins are immovable obstructions. Any area marked with white lines will define Ground Under Repair. Relief must taken in accordance with Rule 25-1b. If any staked tree interferes with a player’s stance or intended area of swing, the ball must be lifted, without penalty, and dropped in accordance with Rule 24-2b. The right hand side of hole 9 is to treated as a “Waste Area”. Golfers are allowed to ground their clubs in the sand, even take divots on practice swings without penalty. 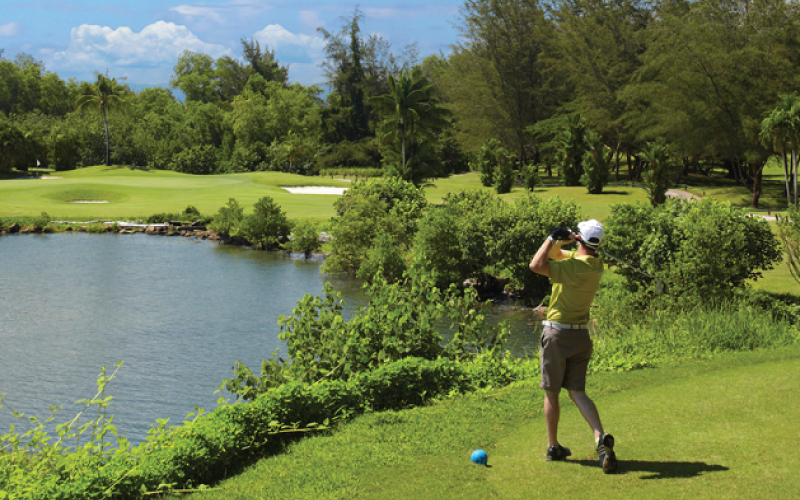 Golfers may remove loose impediments such as twigs, leaves or stones. Note: Desert plants in the “Waste Area” shall be played as the ball lies. A ball lying in the desert area can be deemed unplayable. Relief taken under rule: 28 Unplayable lie. Drop a ball, under the penalty of one stroke, in the drop zone provided (even though the drop zone may be nearer the hole than where the original ball last crossed the margin of the hazard). Buggies must be kept on path at all times unless otherwise directed. Please rake bunkers, repair ball mark on greens and replace divots. Distance are measured in meters to the center of the green. Temporary stop play - 1 long blast.